Every summer in July, in an oak grove in Oklahoma, Euchees gather for a week of ceremonies and dances. Traditionally, the corn is not eaten before the Corn Dance ceremonies are performed. These women dance the Ribbon Dance; turtle shells on their ankles create some of the rhythm. 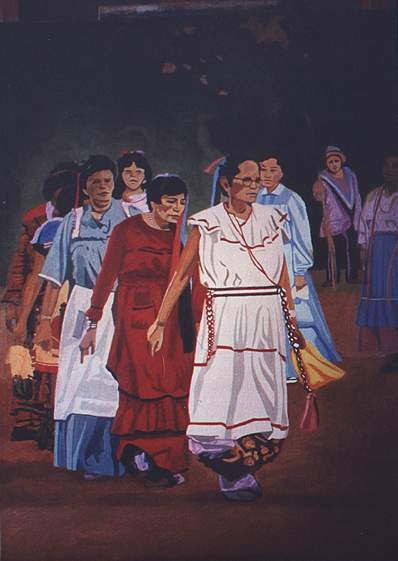 The elder women lead the dance. The Euchees are a tribe, that for the most part was moved from the Southeastern U.S. on the Trail of Tears to Indian Territory, now Oklahoma. Most Euchees there live close to Tulsa. Only a few native speakers of the language still survive, although there are classes to teach and record the language.